I know, I know, there’s still a bit of baseball left … a World Series (yawn). With some teams … playing somewhere. Oh, I don’t know. I guess I’ll watch. But, secretly, I’ll be counting down the days until Opening Day 2014. But, before we close the book on 2013, here are some extra innings to honor my sweet Baltimore Orioles and their second consecutive winning season. Free Baseball: All About the O(rioles): Offense, Defense, Pitching & Pumpkins! 10th Inning: “Crush” Davis, Home Run King. Orioles First Baseman Chris Davis hit 53 home runs this season. The most anyone hit this year and an Orioles’ record. Wanna see the first 50? Of course you do. And, it will only take a minute. The Orioles’ Manny Machado makes beautiful baseball over on third. “Hakuna Machado” – a takeoff on The Lion King song – is a Birdland cheer for Manny. Here’s a great song and video some folks over at MLB.com put together for Manny this season. Just 90 seconds. Plus, Orioles’ reliever Tommy Hunter sings. Worth it just for that. 12th Inning: Jim Palmer, Pitcher. Jim Palmer, Pitchman. In addition to pitching, Jim Palmer sold a lot of Brylcreem and Jockey shorts back in the day. A few of his commercials were gathered by the cool blog “30-Year Old Cardboard” to recognize Palmer’s 68th birthday earlier this week. Click here. One of the most popular posts on this blog is from last October when I wrote about the Oriole pumpkin I carved. The pumpkin is pretty miserable (in a “you let a 3-year-old hold a knife and slash up your pumpkin?” sort of way) and the photo is blurry (“and he took the photo, too?”). It was a sloppy Oriole pumpkin honoring a team that, in 2011, was pretty sloppy, too – they lost nearly 100 games. In all of baseball, only Seattle, Minnesota, and Houston played worse. But, the photo includes Oscar – who lived to be nearly 20 and was a mighty good cat. He always smelled like sunshine. He’s gone now, but I always smile when I see this picture. 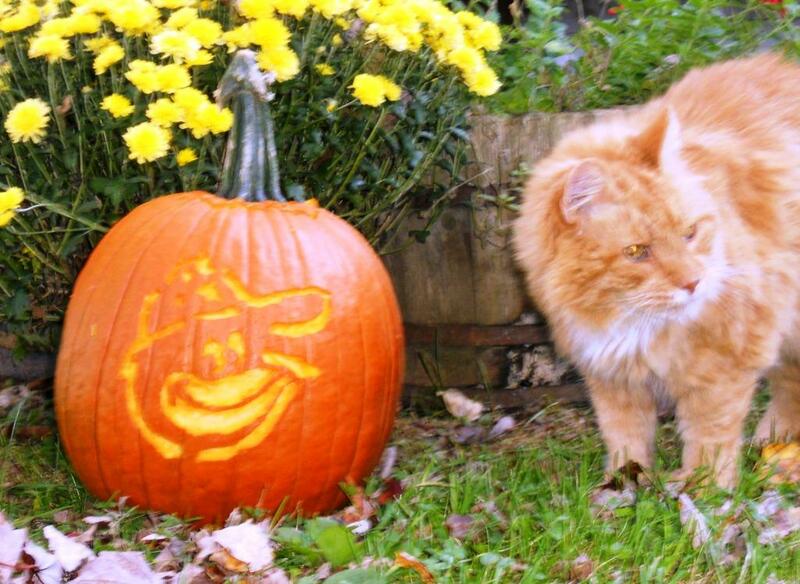 For the post, Oriole pumpkin stencils, and all things pumpkiny, click here.